We are not going to simply vote on an airplane. We will make a fundamental decision: Should we voluntarily give up the ability to ensure our security? This security is not only the foundation of our well-being, but also a decisive factor in the attractiveness of a site. Without new combat aircraft, we will have to intensify the use of our fleet of F/A-18 fighters. The life cycle of these aircraft will be shortened by several years. Without the Gripen, our Air Force would be grounded from about 2025, which would of course also affect the image that Switzerland enjoys as a country. Such a situation would have incalculable consequences. Without an Air Force, we would not be able to ensure the security of international meetings and peace conferences in our country. It would be the same for major international sporting events. And I have not even mentioned the United Nations. Would this mean less security for their headquarters in Geneva? In addition, the signal that we would send out as a business location would be devastating. In a world characterized by competition and globalization, a secure site, in an independent and politically stable state, is a decisive advantage for many companies. However, Switzerland must have armed forces with modern equipment in order to ensure its security and independence. If we continue to weaken the army, our competitors around the world, who do not spare their efforts to attract them as companies, can only rejoice. Do we want the success of the Swiss economy to continue? Do we want to remain, in future, hosts to international conferences? If so, we need a credible military. If we voluntarily renounce such an army, we would shoot ourselves in the foot and would deal a direct blow to the heart of Switzerland. 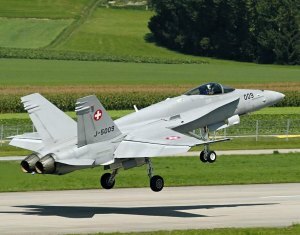 It says a lot about the Swiss population’s love-hate relationship with all things military that the defense minister feels obliged to appeal to his countrymen’s interest in hosting international conferences, and Switzerland’s attractiveness for foreign investment, as the main reasons for voting in favor of the acquisition of new fighters. Maurer obviously feels that military and strategic arguments are not enough, even though all Swiss males are called up for military service, keep weapons at home, and remain in the military reserves well into their 40s.